Share the post "Album review: EVELINE’S DUST – The Painkeeper"
Inspired by the usual suspects – King Crimson, Genesis, et al, and current exponents like Steven Wilson, Eveline’s Dust – a four piece Pisa, Tuscany – have produced a rather fine follow up to their 2013 debut Time Changes. Badged as a ‘concept album’, The Painkeeper is made up of nine tracks spread over a vinyl length 44 minutes, but is equally digestible whole, or sliced and diced. The brief opener ‘Awake’ is a microcosm of what Eveline’s Dust – Nicola Pedreschi – vocals, piano, Rhodes and keyboards, Lorenzo Gherarducci – electric and acoustic guitars, Marco Carloni – bass, and Angelo Carminati – drums, have to offer. Frenetic passages, but for the most part sublimely melodic. Quite remarkably so for such a young band. There’s some marvellously subtle interplay throughout between Pedreschi and Gherarducci, Carloni’s bass tantalises when used as a third lead instrument, and Carminati’s drumming punctuates as well as holding the rhythm together. Perhaps, only in the vocal department is there a weaknesses, but Carolina Paolicchi provides backing vocals to sure up that aspect. And a word must also go to Federico Avella who contributes some exquisite soprano sax on the Crimson-ish ‘NREM’ and ‘A Tender Spark Of Unknown’. While it’s unfair to draw comparisons, in terms of overall ‘feel’ The Painkeeper has much in common, in delivery, with another concept album – Home’s often overlooked 1973 classic The Alchemist. 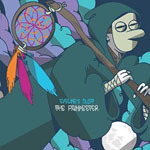 This entry was posted in ALBUM REVIEWS, ALBUM REVIEWS (Mobile), All Posts and tagged album, Eveline's Dust, Italian, prog, progressive, review, rock, The Painkeeper. Bookmark the permalink.